Do you believe the world drastically changed after Trump was elected? Do you believe that every villain became a hero on November 8, 2016? But let’s explore this perspective. The sudden rehabilitation of John Brennan intrigues me. Brennan was the CIA Director from 2013 to 2017. Brennan criticized Trump. Because the President is a terminal narcissist with poor impulse control, Brennan’s security clearance was cut. In other words, Brennan was kicked out of the secrets club. A clear act of retaliation. His ejection was headline news from coast to coast. 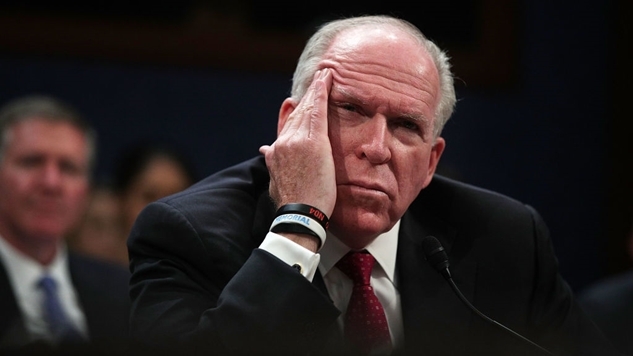 Brennan’s exile is tragic … if you believe he is one of the good guys. If John Owen Brennan is a shining knight of democracy, then Trump’s attack on him is shameful, disturbing, unsexy, [insert fourth adjective here]. We are supposed to care about Brennan, Brennan’s firing, and Brennan’s future happiness. This emphasis on the dignity of a CIA director is strange. See, most Americans don’t know or care who Brennan is. The people who do give a damn are Beltway mannequins, media types, and Resistance celebrities. There’s a reason why they love Brennan. In their worldview, Trump is uniquely heinous—something new and terrible in the American history. Brennan is an example of the decent, bipartisan, professional Washington that we have lost, perhaps forever. He’s Elrond of Gitmo. Under this narrative, the Republican Party just now became incredibly racist, spendthrift, and uncivilized. According to this legend, the Democratic Party was a noble, progressive institution. They had us on the edge of a pacifist utopia, right before Wisconsin somehow fell out of their back pocket. And in this story, the National Security Community are good and faithful servants, fighting a dangerous threat. Brennan, an honorable professional, is being hassled by this petty orange tyrant. Yes, now is the time for all Good Men and Women to come together: David Frum … Jeff Flake … Ben Sasse … the undead Clintons … Kevin French … John Brennan … Elon Musk … Jeff Bezos’ army of serfs … all must unite to defeat the Monster at the End of the Book. Of course this is nonsense. America is the same hustling capitalist exploitation machine it was in 2000, in 1980, and in 1970. The GOP was a corrupt, warmongering, pack of jabbering white supremacists long before Trump. They invaded Iraq on a lie. The Democrats have been a feckless corporate board masquerading since the Clinton era. The Dems almost gutted Social Security twice in the last twenty years. And long before Trump—long, long before Trump—the NatSec community was a gang of cutthroats propping up the American imperial project. Anybody who defends these goons is either amazingly unread or fundamentally dishonest. Oh, don’t get me wrong. I get it. If Trump is an existential threat, then it doesn’t matter that John Brennan lied about torture and defended it. He was the Deputy Executive Director of the Central Intelligence Agency when the CIA was brutalizing people. But hey, as long as Trump’s mean to him, everything’s forgiven, right? ... there is perhaps no figure who bears more responsibility than Brennan for turning Obama’s drone program into what it is today: a secret, unaccountable assassination program across the Global South that visits death and destruction on poor, non-white communities, habitually targets US citizens, and fosters anti-Americanism by frequently killing innocent people. Brennan claimed in 2011 that “there hasn’t been a single collateral death because of the exceptional proficiency, precision” of the drone program, a claim that stretched credulity at the time, and was later proven to be a lie. But it’s Trump. So Brennan is good now. No worries, Johnny. Say hi to your flying robot pals for us! Remember when Brennan claimed that the Paris attacks in November 2015 were due to Eddie Snowden? Remember how Brennan said that the CIA didn’t steal secrets? Remember how he lied about the bin Laden raid? Do you remember when the CIA spied on Senate staffers? The same staffers who were compiling the report on torture? Guess who ran that show? Brennan! He lied about it. In public. Twice. If the NatSec community fell into a bog tomorrow, no worries. We could store Brennan in amber, then use forbidden Jurassic Park science to rebirth the entire NatSec graveyard. Brennan’s a perfect specimen of their depravity. In this era, it doesn’t matter what kind of noxious crimes you’ve done. I’m serious. Go down the list of Resistance heroes. Clapper. Hayden. Comey. A collection of grotesque slime creatures that would dazzle John Carpenter. All of them have been made over into saints by the mainstream media. The instant you criticize Trump, your crimes are forgiven. It’s this weird fetish Resistance types have. It explains why the New York Times has been on a hiring binge for every bearded far-right psychopath. As long as you criticize Trump, your record is scrubbed snow-white. Brennan is the lowest kind of D.C. scum, and I guarantee you he’s going to go on a book tour that will rival Comey’s. The real question is why Americans think this way. Why are we so quick to forget history? The Resistance and the MAGA CHUDs both think Trump is new. Totally outside our way of life. That’s the only thing they agree on. But Trump is not an alien. He’s a con man, and that’s as American as Jay Gatsby and the coke binge. His Administration commits the same felonies as other Administrations. He’s just louder and crueler and dumber about it. The funny thing is, we’ve heard this kind of talk before. After 9/11, every war pundit proclaimed that the nature of reality had changed. We had a great moral crusade, they said. Twenty million pundits informed us Bush had been magically changed from an idiot child into a beautiful warrior king. We broke Iraq, committed war crimes, sank a city, and collapsed the economy. And eight years later, we elected a new President. And when he failed to do what he promised, we were shocked again. We keep doing this. We’re the Memento of countries: our national memory runs back about, oh, two years. We don’t consider the past. We didn’t question why people attacked us. We didn’t look at who Bush hired. We didn’t learn about the countries we invaded. We didn’t consider why Glass-Steagall was there. We didn’t read about hurricanes. We didn’t look at Obama’s track record, or the bankers he put in office. Here’s the result: the people who invaded the Middle East and sank the banks and torture prisoners still have jobs. When did we stop holding our elites to account? When did that become unpopular? We all know Trump is evil. But Brennan is the kind of creature the swamp creates: a CIA morlock who only looks heroic next to a demon-spawn like the President of the United States. America is addicted to clean breaks. It’s a cultural combination of leaving the Old World, and the appealing Protestant idea of being born again. But most religions have ideas about just reckonings. In that spirit, there’s one kind of clearance I want to hear about: Brennan and Trump being driven out of the District with thorn whips. Now there’s a security worth having.